transmission, such as distance and structures. Many process measurement and control wireless connections are accomplished using networks, with routers and access points. Other connections are established across longer distances, conceivably outdoors. In many of those cases, there are barriers or obstructions that will attenuate the wireless signal sufficiently to prevent reliable data transfer. Hills, wooded areas, walls, tanks and other structures and natural features can present real challenges to wireless signal transmission. Another transmission challenge is the distance between transmission and receiving stations. One, though not the only, solution to overcoming the challenge that can arise due to extended distance or substantial obstacles between the transmitter and receiver is the placement of a repeater. 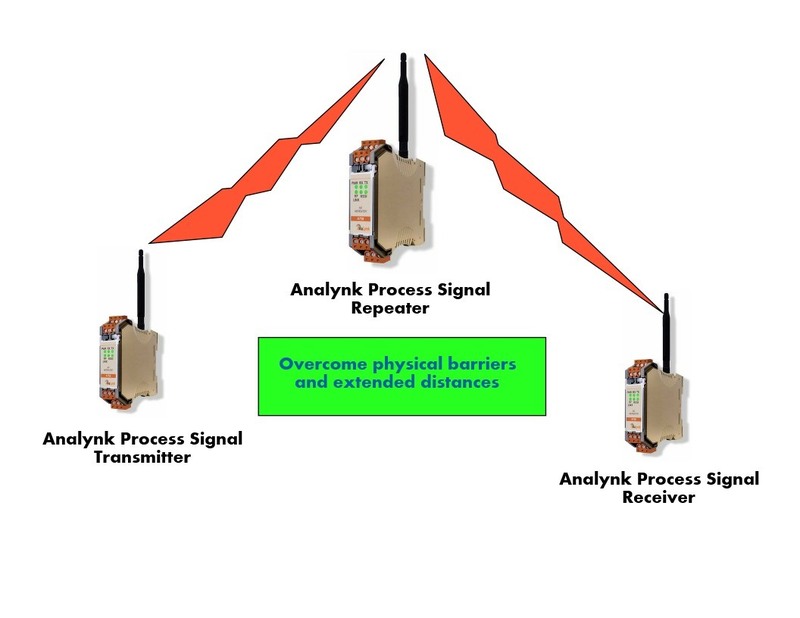 Analynk provides a repeater that can be strategically located between transmitter and receiver to extend the overall transmission distance, or route the signal around obstacles that may otherwise degrade the transmission. The data sheet included below describes how easy it is to apply and provides all the technical details. Wireless connectivity is an incredibly flexible option for delivery of process data from measurement point to control point. 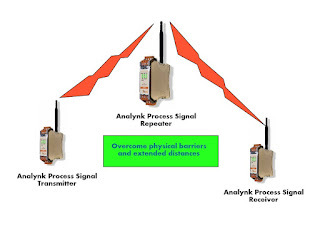 Contact Analynk with your wireless communication challenges and get solid practical solutions. long distances have to consider transmission path geometry. A Fresnel zone, of which there an infinite theoretical number, is an ellipsoid shaped area extending between radio signal transmission and receiving antennas. Having a basic understanding of their impact on successful implementation of a lengthy wireless process signal connection will prove useful. Wireless transmission of process signals in industrial settings becomes more prevalent every year, and should continue to do so for quite some time. Many installations are part of networks operating similarly to the wifi you may have in your home, with multiple points communicating via a network control scheme of some sort. The facility is flooded with signal coverage through multiple access points, so there may not be much need to consider signal propagation. This is an oversimplification, but as an operator or implementer, making the actual signal connection is probably not going to be an issue in most cases. What about the other cases? An extended transmission distance across an outdoor area requires more understanding of signal propagation and factors that impede successful delivery of process data from transmitter to receiver. One concept that comes into play is the Fresnel zone. Let's avoid an overly technical approach to Fresnel zones. The purpose of this post is to provide those with limited radio expertise familiarity with the subject of Fresnel zones at a level enabling visualization of the concept, and also to recognize its potential impact on achieving a successful wireless process connection. We often consider the transmission path between two points to be the familiar "line of sight", an unobstructed straight line between transmitter and receiver. In practice, radio frequency transmission is more accurately characterized by Fresnel zones. Being aware of the shape of the first, or primary, Fresnel zone for your application is an important element in identifying potential obstructions. A general practice is to keep the primary Fresnel zone at least 60% clear of signal obstructions, in order to maintain high wireless link performance. There are numerous sources of Fresnel zone calculators online, but a strong recommendation to consult with your selected wireless equipment provider is in order here. Combine their expertise at applying their products with your application knowledge to leverage an effective solution. 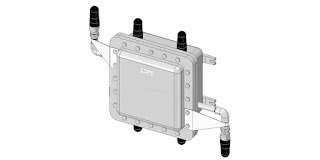 Modern industrial radio frequency (RF) communications gear enables the establishment of process signal connections across very small or very large distances. 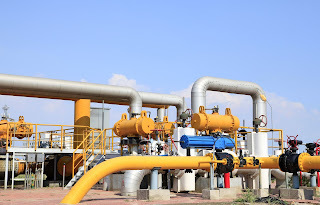 The advantages of implementing cost effective connections within a very short time frame makes wireless connections a popular option in industrial settings. A misconception arises, from time to time, that it is necessary to have a dedicated transmitter and receiver for each process signal. 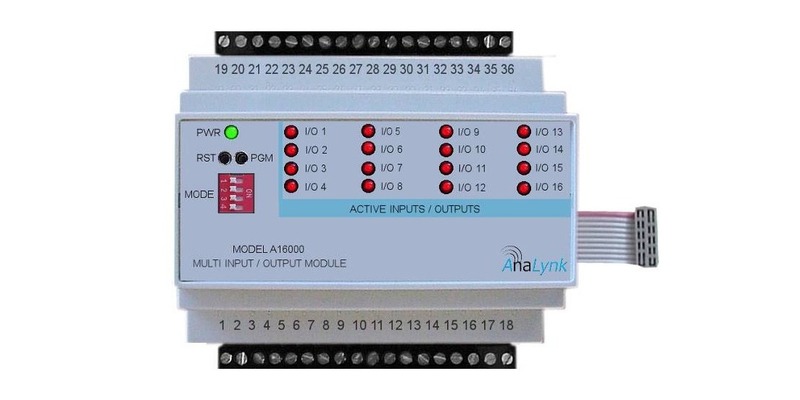 Analynk has a solution that provides for delivery of up to sixteen process signals over a single transmission path. Analynk provides hardware that easily allows the transmission and reception of up to 16 I/O points using single transmission and reception point devices. The A16000 Expansion Module can be configured with up to four internal cards that accommodate various types of input and output signals. The configuration process is similar to setting up the I/O on a PLC. Connect the process signals to the A16000, and the A16000 to one of Analynk's transmitter or receiver devices. Setup is straight forward and allows the installation to be operable in a very short time frame. The A16000 can also be used to expand existing installations as process I/O points increase. Share your wireless communications and signal transmission challenges with the experts at Analynk and get recommendations on how to best implement workable solutions. Point Enclosure accommodates six explosion proof antennas. The Aruba AP-274 wireless access point carries a description of it's operating environment range that says "Purpose-built to survive in the harshest outdoor environments, 270 series APs withstand exposure to extreme high and low temperatures, persistent moisture and precipitation, and are fully sealed to keep out airborne contaminants. All electrical interfaces include industrial strength surge protection." While the access point can withstand outdoor environments, maybe even some industrial environments, there is a large class of industrial settings where it is just as important to protect the environment from the device as it is to protect the device from the environment. Hazardous atmospheres require isolation and special housing of electrical gear that have potential to be source of ignition. Analynk manufactures enclosures for industrial wireless access points, facilitating their installation in hazardous locations. Each access point enclosure is specifically targeted and designed to provide easy installation of specific wireless access points from a range of manufacturers. Every model is provided with UL listed explosion proof antennas, a mounting bracket designed for the target access point, and RF cables to make the antenna connections. Enclosures have penetrations specifically located to accommodate the target access point.The current offering accommodates a range of units from Symbol, Cisco, Meru, Aruba, HP, and Motorola, with more models added regularly to accommodate additional wireless access points. The website has a newly added data sheet for the AP617, specifically designed for the Aruba AP-274 dual band access point. Analynk Wireless specializes in industrial wireless communications. Your wireless communication challenges are welcome at Analynk, so make contact and share your application requirements. Combining your own knowledge and experience with Analynk's industrial wireless application expertise will produce an effective solution. The new datasheet for the AP617 is provided below. You can see all the models and their companion access points on the Analynk site.